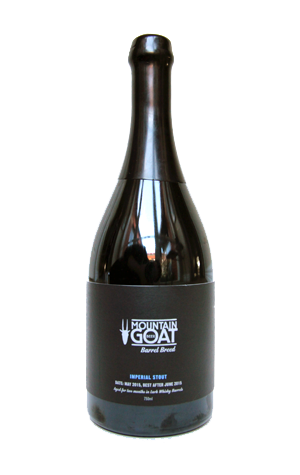 Shortly after Mountain Goat's first Barrel Breed release was named Champion Australian Beer at the Australian International Beer Awards, someone at the brewery told us they reckoned the beer that had followed the barley wine into the Lark Distillery whisky barrels for a couple of months – an imperial stout – had turned out better still. It's a view since shared by a second person associated with Goat, so it's fair to say expectations were high for this 12.1 percent beast; better than the best? Bring it on! The first thing that strikes you is how much impact the two months inside the French oak that once housed whisky has had on the beer. The aroma is less of the dense roast, dark chocolate, leather or molasses one might expect; instead there's a juiciness there – a fruity, spicy character from the whisky that takes centre stage. One gets the impression the base beer (11 percent before it went into the barrels) would have been, like Goat's Surefoot Stout, towards the sweeter end of the stout scale. Thus, backing up the whisky is much in the way of creaminess: chocolate and vanilla to the fore, with the roast playing a supporting role. It's the sort of beer for which words such as "luxuriant" and "decadent" were invented, one that, to our tastes, has echoes of Boatrocker's first Ramjet and even the bourbon barrel version of Garage Project's Cockswain's Courage Imperial Porter; damn fine company to be keeping. It's also damn rare; the one and only keg was kept at the brewery and all the bottle stock they had there sold out early on launch night (update: there's actually a few left as of 28/7). So, if you can't find any on sale but know of a Goat-friendly venue, ask them nicely if they got one they're hiding away that you can share. NB A new version of Goat's black IPA Before the Dawn is also out now – keg only.